Earlier this month, Swiss MVNO Coop Mobile announced it will switch new customers to the Swisscom network from Salt, and it’s easy to see why - as our latest mobile experience report for Switzerland shows Swisscom leading average download and upload speeds as well as latency across the country, by quite a margin. With average speeds on both 3G and 4G of 33.33 Mbps, Swisscom perform best across the country for the fastest download speeds. Sunrise averaged speeds of 19.81 Mbps between October and December, just ahead of Salt, which recorded 18.78 Mbps based on approximately 47 thousand download tests on its network. Splitting the 3G and 4G results shows Swisscom reach average speeds of 36.96 Mbps on 4G (38.35 in Zurich) and 6.21 Mbps on 3G. On both 3G and 4G, Swisscom also perform best for latency with average results of 15.0 ms and 45.9 ms respectively. Although latency delays across the operators are close, as Sunrise averaged 16.5 ms and Salt averaged 18.0 ms on 4G. Latency results for all operators increased in Vaud to between 19 and 21 ms, with Swisscom still taking the lead. Our 4G tests show all operators in Switzerland suffering from some degree of network stability, as Sunrise perform well for average packet loss but are let down by their relatively high levels of jitter. 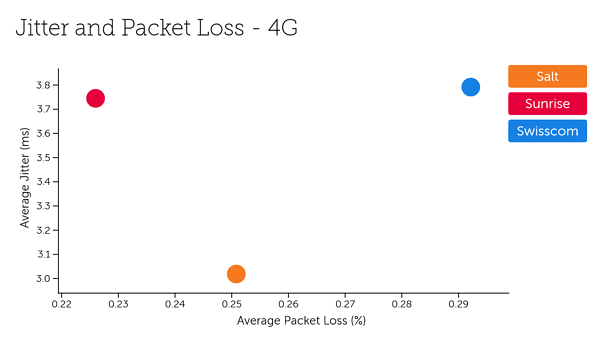 Despite performing best across other metrics, Swisscom recorded the most jitter and packet loss of all three networks, with Salt arguably taking the lead with low jitter and average packet loss across the country. Our findings for Switzerland are based on 5.34 billion network quality measurements including 804 thousand speed tests between October and December 2018. Our latest complimentary Mobile Experience Report is available to download from the Tutela Insights portal.